...I was struck by the scientist who said that her students were able to figure out her politics simply by noting what she did not say. Just by teaching her subject, without adding extraneous leftist political harangues, she had revealed herself to be a closet Republican. You won�t believe what happened when the faculty found out about her politics. But the full horror story is almost less disturbing than the reality of that single observation about silence. Particularly in some of the non-science disciplines, it really has gotten to the point where mere silence on matters political is enough to reveal you as the enemy. Whole short piece at NRO here.�Register your interest in seeing the documentary here.�See the trailer here. What does it take to be an academic pariah? Be conservative. Powerline. It's not funny. Deeply disturbing and distressing. Maoist. Another plug for the Indoctrinate U documentary. If the main�job of education is to transmit foundational knowledge, values, and the culture, it cannot be done without a required core. The American Council of Trustees and Alumni (ACTA) have one.�Fun to read. Columbia and Chicago have the best ones I know of, but every college has a potential�core curriculum - it's just not required. Only Mom and Dad can require it - and they should. Ask�us what�we have required, if you're interested. Or maybe I will post it. ACTA is not pleased with the Vanishing Shakespeare. Their report here. Freshman Algebra in 1961. Right Wing Nation. I especially like the quiz questions like�"How would you approach this problem?" and "Why can't this problem be solved?" My opinion on high school? No reason for it to be four years. Three is enough to do the job. Trivia question: when and why was American�High School increased from three to four years? And, of course, for grown-ups who feel inadequately educated (that should mean everyone), don't take a course. Use The Teaching Company. I have never been disappointed in them. 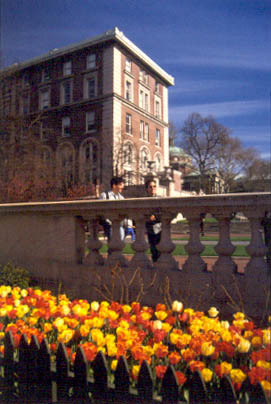 Photo: Columbia's Hamilton Hall, across College Walk. Interesting that Columbia College�is now the most competitive liberal arts college in the country, and has the largest required core curriculum and the largest number of required courses. That says something. You can thank Rudy and Bloomberg too, who have cleaned up the city. I would like to recommend Catholic colleges for core curriculums. My daughter goes to Fordham, Jesuit university in NYC. Their core curriculum is a solid two years, and tougher than Columbia's. In addition to the usual, there are four required courses in Theology and Philosophy. And these are rigorous courses. I have had many other relatives go to Catholic colleges, including some who started off as atheists, and this is typical. One of my nephews went to Thomas Moore College in New Hampshire, which includes a requirement to learn Greek or Latin. He chose Greek, and loved it. that meant students didn't know what my politics were. come back. All understand why I keep my mouth shut. you with them, however. " It's the same for those of us in the arts. We keep our mouths shut when the bashing begins. However there are times when I'm unable to keep my mouth shut, but I choose those battles carefully. How sad it is, that in this great country of ours, those of us who happen to not be liberals have to keep mum about our politics for fear of retribution in some form or other. But politics doesn't belong in a classroom, unless it is the subject matter at hand. It has nothing to do with the job. Academics, arts, but needless to say, though I am anyway, family. A gathering of 30, and you know it isn't possible to freely debate almost anything. Politics has intruded into every sphere. A truly sad state of affairs. It goes much deeper than simply not being able to express an opposing opinion. Oh, yes--much deeper. It is about taking full and complete control of all education. People have been destroyed, because they wanted not to work at a particular college anymore. White men have been targets at universities for about 15 years now. It is about deconstructing this nation. I know white men in academia, who have their office doors blocked open with heavy objects; in order to protect themselves from fraudulent charges. I know white men, whose wives have been threatened at home "make him understand he has to make our gal look good--or else." However, I also know of at least one white woman, a nursing professor, who was destroyed. Yep, she had been teaching nursing, highly regarded and tenured. Until, one day she refused to pass a a young African/American female out of a nursing science course (sorry, I can' t remember which one). $70,000 worth of legal fees later, she still did not have her job back. She finally gave up. The liberals have been brutal during the 90's. Go along, or die is their policy. Does that remind you of another group? For many years, it has been a dirty secret that if a white man refused to continue working under a woman and simply wanted to move on to another job--he would be destroyed. Make the incompetent, and the spoiled lazy daughters of the wealthy (typically the only white females that get pushed up the academic ladder) look good or else. You see it has been the daughters of the wealthy liberals, who have been the first to benefit from women's lib. Most particularly if daddy was a high powered attorney in town. However, the real criminals in all of this are those Republican, conservative attorneys, who refuse to confront the universities in court. Too afraid of the personal backlash against their own children. Sorry, Barrister: just had to say it the way I see it! Nothing personal. I am not hypersensitive. Appreciate all and any comments!